Although I’m partial to the the Old Crow Medicine Show version of Wagon Wheel, I definitely enjoy watching the music video version by Darius Rucker from his 2013 True Believers album on YouTube above – I also enjoy seeing the Duck Dynasty gang in it. I haven’t posted as much of the “country sound” music that was part of my music listening back in the day, but the two versions of Wagon Wheel brings back memories of the Allman Brothers, Ohio’s Pure Prairie League and Canada’s Cooper Brothers, among others that I listened to a lot back in college. 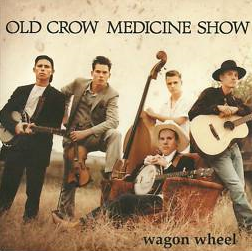 “Wagon Wheel” is composed of two different parts. The chorus and melody for the song come from a demo recorded by Bob Dylan during the Pat Garrett and Billy the Kid sessions in February 1973. Although never officially released, the Dylan song was released on a bootleg, usually named after the chorus and its refrain, “Rock Me Mama”. Dylan left the song an unfinished sketch. Chris “Critter” Fuqua, Secor’s school friend and future bandmate, first brought home a Bob Dylan bootleg from a family trip to London containing the rough outtake called “Rock Me, Mama”. Not “so much a song as a sketch, crudely recorded featuring most prominently a stomping boot, the candy-coated chorus and a mumbled verse that was hard to make out”, the tune kept going through Secor’s mind.